Loans are great things. They allow you to make big purchases and pay them off over time. Sure, we would all love to be able to pay for a car, a house, or an education out of pocket, but a lot of us just don’t have that kind of cash in our accounts. So getting a loan is a great way to increase your purchase power for important items. And if your credit rating is good, you’re likely to get a great rate for your loan. But what if your friend or your family member needs a loan and doesn’t have as great of a credit rating? 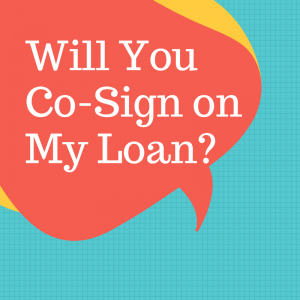 Should you co-sign on their loan? In short, no. While there will be outlying situations, you should generally never co-sign on a loan. What does it mean to co-sign on a loan? Essentially, you are telling the lending company that if the primary borrower can’t pay the loan that you will pick up the payments for them. If someone doesn’t have a good credit score (or no credit score at all), they might have trouble getting a loan and may come to you for help. Let’s say you know a guy named Mike. He’s just out of college and he wants to buy a new car. But he doesn’t have a very deep credit history so his credit rating is low. He has a good job and has never defaulted on a loan before. He’s a good guy, and you would like to help him. So you decide to co-sign on his loan for him. After all, you trust him. At first, Mike makes all his payments on time, just like you expected. Then something happens. Mike has stretched his finances a little too thin and starts to miss payments. The lender then comes to you as the co-signer to take care of the payments for Mike. Now, it’s possible that Mike is a close friend and you don’t mind that you’re doing this for him. But more likely, you find yourself a little frustrated that you’re paying off Mike’s loan for him. And you can’t get out of it. Once you’ve co-signed, you’re stuck. Any new loan you co-sign on will appear on your credit report. This will increase your monthly debt-to-income ratio, even though you aren’t the one making the payments. So even if Mike does as planned and makes every single payment on his own, you may still have a negative effect from the loan. This will really only matter if you plan to take out another loan or open a credit card, but it’s something to be aware of, especially if it’s a long term loan. Of course, if the loan ends up in default, that becomes an even bigger issue for your credit score. Plenty of parents co-sign on loans with their children, especially when it comes to education loans or other loans taken out when the child is in their late teens or early twenties. Look at it this way – is the person who wants you to co-sign someone you would happily bail out of financial trouble if they were suddenly unable to make payments? If so, then absolutely you should consider co-signing on the loan. It will help them build their credit and allow you a hopefully easy way to help out. Just be aware of what you’re getting into and don’t let yourself be dragged into a financial mistake out of a sense of obligation. I will co-sign for my kids but will most likely not to other family members. By cosigning, we are obligated to pay for the loan if the person we cosigned for ended up not paying it. I’d rather lend the money than cosign for someone. Just my 2 cents. Agree – it’s definitely something to consider seriously before signing on the dotted line for a loan of any type. That said, if it wasn’t for my mum going guarantor for me, I woulD never have gotten into the housing market. It’s probably smart to take a good look at the spending habits of the other half.